The next paper presentation I’ll review from the upcoming EAST Annual Assembly is from a consortium of six US trauma programs, and appears to be under the direction of faculty at the McGovern Medical School in Houston. They recognized that rates of damage control laparotomy (DCL) vary widely throughout the US. In part, this is due to the lack of hard and fast indications for the application of this procedure. This procedure is used in cases where patient physiology (or trends in that physiology) would suggest that persisting with an open body cavity would lead to hypothermia, coagulopathy, additional injury, or death. This study entailed the prospective review of every DCL performed at the centers over a one year period. Each was adjudicated by a majority faculty vote as to whether it would have been safe and appropriate to perform a definitive laparotomy (DL) instead. DL means that all injuries are fixed and the abdomen is closed. 872 trauma laparotomies were performed: 209 DCL and 639 DL. There were 24 intraoperative deaths. Overall, this intervention (reviewing each and every damage control procedure immediately after) did not decrease the DCL rate as hoped. The authors cited the second look laparotomy disagreement as a possible target to improve results. All DCLs are not the same. Six different centers were studied, each with their own DCL popluation. What was the blunt:penetrating mix for each? What were the specific mechanisms and injuries sustained? ISS? It could be that the study group was not homogeneous, making it more difficult to judge appropriateness. Was the study powered well enough to detect differences? The total number of DCL cases was only 209, or 35 per center. And of course, some had more, some less. In our original DCL paper from Penn, the clinical significance first showed up only in the subset of most severely injured penetrating injury patients. Did you have enough patients? What exactly was the intervention that would drive down the DCL rate? Although this is (kind of) a prospective project, the analysis of each case and the consensus vote took place after each procedure. Was this done at each institution, or only by the research group at the mother ship? How did the results get disseminated to all surgeons so that they could apply the findings to their next trauma laparotomy? Look at the outlier. This is always valuable. Why was center #4 so much lower at the beginning of the study period compared to the one year historical control? Were their laparotomy numbers lower? Patient/injury mix different? Did you interview that group to see what their insights were? This is one of the most interesting findings, in my opinion. I’ll be sitting in the front row for this one! Reference: Better understanding the utilization of damage control laparotomy: a multiinstitutional quality improvement project. EAST 2019, Paper #12. Damage control is over 25 years old already! We continue to refine the techniques and closure techniques/devices, and have developed novel ways to speed closure of the abdominal wall in order to avoid pesky hernias. But the process itself is time intensive, and typically several days pass with regular returns to OR until closure is achieved. This is one of the prime areas in which human error can occur, especially with modern service-style coverage of trauma patients. In the old days, trauma patients were admitted by their surgeon, and that person provided their care nearly continuously until discharge. He or she rounded on them daily, took them back to the OR when needed, and then discharged them. This is less practical (and desirable) in this day and age. And even if it seems possible, it’s not. No one can be on call 24 hours a day, and provide comprehensive care to every patient, around the clock. Many trauma programs have adopted a “service model”, where patients are admitted to a defined care team and managed by them. The team is led by a surgeon, but that person may change on a weekly (or in some cases nearly daily) basis. I call this the “interchangeable head” model, and to make it work there must be excellent handoffs during any leadership change. In some cases, a patient may undergo a damage control procedure by one surgeon, but another must do the takeback and possibly the definitive closure. In this case, the handoff is critical! It is paramount that the next surgeon know everything about the first case so that they can perform the correct procedure. Do not rely on the medical record and previous operative note. It may not be available, and there is usually some loss of information in recording it anyway. Don’t believe it. Ideally, meet face to face with the previous surgeon(s). Get the blow by blow description of exactly everything that was done and how. Also discuss what still needs to be done, and when. Try to maintain a uniform philosophy of patient care across surgeons. If face to face is not possible, a telephone call is acceptable. The discussion is exactly the same. If the surgery occurred at an outside hospital and was then transferred, you must call the initial surgeon to have this discussion before going to the OR! If something unexpected is encountered during the case, make sure you have contact information so you can call during the case. Applying these concepts will decrease the possibility of error, as well as the likelihood of any iatrogenic harm to these complex patients. Damage control surgery for trauma is over 20 years old, yet we continue to find ways to refine it and make it better. Many lives have been saved over the years, but we’ve also discovered new questions. How soon should the patient go back for definitive closure? What is the optimal closure technique? What if it still won’t close? One other troublesome issue surfaced as well. We discovered that it is entirely possible to leave things behind. Retained foreign bodies are the bane of any surgeon, and many, many systems are in place to avoid them. However, many of these processes are not possible in emergent trauma surgery. Preop instrument counts cannot be done. Handfuls of uncounted sponges may be packed into the wound. 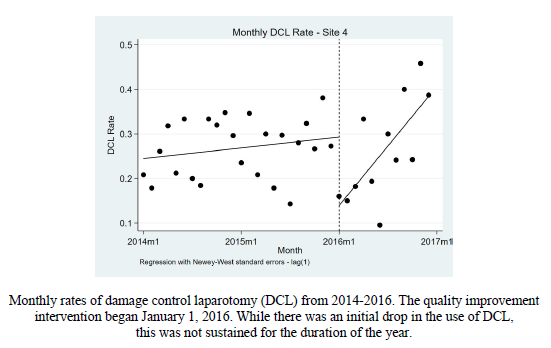 I was only able to find one paper describing how often things are left behind in damage control surgery (see reference below), and it was uncommon in this single center study (3 cases out of about 2500 patients). However, it can be catastrophic, causing sepsis, physical damage to adjacent organs, and the risk of performing an additional operation in a sick trauma patient. Use only items that are radiopaque or have a marker embedded in them. This includes surgical towels, too! Implement a damage control closure x-ray policy. When the patient returns to OR and the surgeons are ready to begin the final closure, obtain an x-ray of the entire area that was operated upon. This must be performed and read before the closure is complete so that any identified retained objects can be removed. Tomorrow, a sample damage control closure x-ray. What does a retained surgical sponge look like? Reference: Retained foreign bodies after emergent trauma surgery: incidence after 2526 cavitary explorations. Am Surg 73(10):1031-1034, 2007. Yesterday, I wrote about ways to reduce and hopefully eliminate retained foreign bodies (instruments, sponges) during damage control surgery. Today, I’ll provide a sample x-ray and some tips on how to use this tool most effectively. 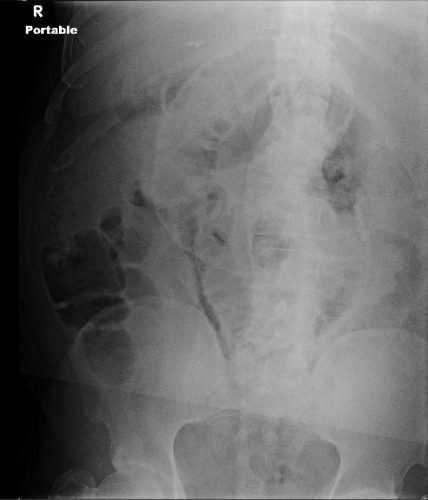 Here is an abdominal x-ray obtained just prior to closure of a patient who underwent damage control laparotomy. The OR record and surgeon from the initial operation documented that four sponges had been left in place for hemostasis. Wrong! This image is not complete. This patient is larger than the x-ray plate used. The area under the diaphragms, the pelvis, and the entire left side of the peritoneal cavity have not been visualized. Always make sure the patient is on an x-ray OR table. It is so annoying (and potentially a sterility problem) to have to slide the plate under the patient! Help the radiology tech to locate the desired imaging field using folds in the towels covering the body region. For example place the confluence of folds in the center of the towel in the exact place you want the center of the x-ray to be. Make sure the entire body cavity has been imaged! This may mean bracketing the area with several shots. Read the image yourself! But if in doubt, or in patients with drains or other odd objects, call the radiologist to help you out.